I remain obsessed with asparagus. I found a purple variety at the State Farmers Market the other day. I’ve cooked purple asparagus before, and if you don’t overcook it – which you should never, ever do to asparagus unless you’re looking for slimy vegetable paste – it retains its color. I decided to adapt a risotto recipe from Barbara Kafka to use the asparagus, which would go with the roast chicken I had in the oven. Afterwards, I was reminded why I seldom make risotto – my wrist is still fatigued from stirring. But it tasted great. Put the spinach, parsley and onions in a food processor and pulse until finely chopped but not pureed. Heat the olive oil in a large saucepan over medium-high heat. Put in the rice, and saute, stirring constantly, for 2 minutes. Reduce the heat to medium. Add the chicken stock a little at a time, continuing to stir without ceasing. Add more only when the liquid has been absorbed. Cook for 15 minutes, still stirring. Stir in the asparagus and the spinach mixture. Add more liquid if needed. Continue to cook and stir until the asparagus is cooked but still firm, only a few minutes. Season with salt and pepper to taste. Remove from the heat to prevent sticking. Serves about 4 as a side dish but could also be a main dish. This just in, thanks to The Hub: Using a bread machine to make risotto here. I have an intense relationship with asparagus. 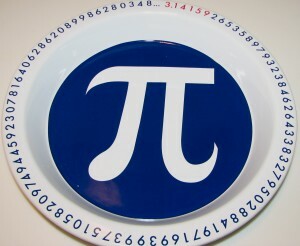 It’s in my kitchen nearly constantly for the scant few weeks that I can find it. Grilled or oven-roasted, with only a little olive oil and salt, that’s perfection. But I do seek change occasionally. On Sunday, I made super-simple cold marinated asparagus. First, be sure to steam or boil the asparagus only until it’s bright green. Go any farther, and you’ll have limp mush. This will take mere minutes. The dressing started with olive oil, lemon juice and a dash of white wine vinegar. I added about a half teaspoon of dried lemon peel (you could use freshly grated lemon zest, but I had the dried on hand and it was quick) and generous shakes of a dried-herb seasoning blend that contains chives, basil, tarragon and dill, plus salt and pepper. I toasted about a tablespoon of sesame seeds and chopped up two green onions. While the cooked asparagus (asparagi?) was still warm, I tossed it with the dressing and sprinkled on the onions and sesame seeds. I chilled the mixture for a couple of hours and served it cold. I will say it again, if you’re using asparagus in a cold salad or marinating it, do not overcook it. Even a little undercooked is OK. I was thinking a cold rice salad with asparagus might be nice, maybe with red bell peppers and Asian touches, like sesame oil. I felt it was time for a field trip, and there’s nothing farther afield than New Orleans, I say. My friend Judy Walker, food editor for the Times-Picayune, took me to Cochon, where I ate a fried soft-shell crab bigger than my fist, with a sweet-spicy sauce, and a plate of stellar house-cured meats. I also met chef-owner Stephen Stryjewski as he test-drove his new pig cooker (the chrome vents were still shiny) on a side street. He was preparing sample pork products for an upcoming charity event, Hogs for the Cause. Stryjewski was complaining that his smoke was “harsh.” I said he was using the wrong wood, and he ought to know that since he lived in North Carolina for a while. Judy took me on a tour of a street which is undergoing a food renaissance near her neighborhood. Freret Street was a thriving commercial strip in the 1970s and the restaurant where we were eating, High Hat Cafe, was a kosher bakery. But crime in the area increased, and after the bakery owner was shot and killed, businesses began to move out. The area continued to decline until Hurricane Katrina. Storm recovery projects began to revive the area, and now it’s become a destination for students from nearby Loyola and Tulane universities, plus traffic from a reopened hospital. Among the places that have opened within the last three years: Company Burger and Dat Dog (both bake their own buns), Pure Cake, a Japanese restaurant, and a bar called Cure, which offers artisan cocktails and a small-plate menu. We ordered salads at High Hat specifically so that we could consume chef Jeremy Wolgamott’s pies free of guilt – not that guilt is a concept much used in New Orleans. 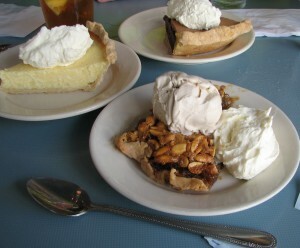 The offerings: Creole Cream Cheese Chess Pie, Warm Peanut Pie with Jack Daniels Ice Cream and Chocolate Chess Pie. The peanut pie was like a pecan pie, except with salty peanuts. It had that whole sweet-salty thing rocking. The Chocolate Chess Pie was a good version. But I was fascinated by the Creole Cream Cheese Chess Pie. There’s no hot pepper in Creole cream cheese – what seems to be “Creole” about it is that the French Creoles in old New Orleans made it. The cheese is made with skim milk and buttermilk, and gives a tang and thicker texture to chess pie that I found addictive. Wolgamott makes his own Creole cream cheese, and gave me his recipe. I haven’t tested it yet, so I hesitate to put it out right now. I will be trying it out soon. Happy holiday. Mine is apple. My sassy, tattooed friend Kat Kinsman over at Eatocracy offers an excellent take on the Paula Deen flap here. It’s a good read, and Kinsman brings in a lot of information to be dealing with someone who won’t give interviews. I have been a little surprised at the amount of venom directed at Deen, after she revealed that, during years of promoting her butter-and-fat-soaked recipes, she had diabetes and then hooked her name up with a drug company. 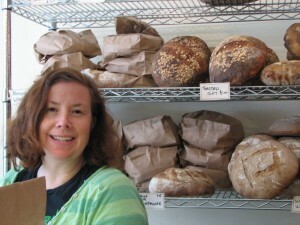 More serious are recent charges of discrimination and racism against her family business. My biggest objection to her cookbooks is that they promote a stereotypical style of Southern cooking. Southern cooking has always been more than fatback and ham hocks, and is even more varied now as the South absorbs international influences. Flipping through her cookbooks is to enter a fantasy world, like going to a Jimmy Buffett concert. I love Buffett, but I know the man doesn’t go to Margaritaville every night (anymore) and neither do I. Once a year I can live the fantasy, but I can’t stay there. I have no great admiration for Deen. I don’t have any for Martha Stewart either, but I’ll ask the same question about Deen that I did when Stewart was imprisoned for stock fraud: Would a man be treated the same way for the same offense? And, people, if you’re going to get worked up about something, get angry about food deserts in our cities or kids going hungry or the lack of healthy food in schools. Deen isn’t worth it. It was like Christmas in March. (well, March Madness is also like Christmas in March, but I don’t get gifts.) I found a forgotten holiday gift in a cabinet – and how could I have misplaced this one: the “Bacon Love” 2012 calendar (Andrews McMeel Publishing). With every day, I get a dose of bacon love, lore and goodness. Except for weekends. I guess the researcher had to have time off to cook his own bacon. There are quotes about bacon from TV shows, websites and books; bacon products and tips for purchasing bacon; and, or course, tales of extreme bacon love. Like the entry for March 1: “Foreign & Domestic in Austin, Texas is famous for The Ripper sandwich: a bacon-crusted sausage on toasted brioche topped with mustard and relish and served with potatoes, deep fried pickles and onions.” I can start my days with bacon cocktails, bacon-and-egg ice cream, or grilled cheese and bacon. Unless I chew on the little calendar sheets, they’re all calorie free. It’s a very educational calendar. I have found out that a sounder is a small group of pigs or wild boar foraging in woodlands, according to Jan. 9. And, according to Feb. 3, Anthony is the patron saint of bacon. All hail. What surprised me were the pleas for the spaghetti sauce recipe I referred to. It’s nothing fancy, really, but it can help you abandon the tyranny of the jarred sauce. The secret is to load it up with plenty of flavor. That means letting go of those ancient jars. This recipe is also merely a starting point for you. I’ve rarely measured this myself, just scooped heaping spoons of herbs into it. Add more or less of things you don’t like, or omit the meat for a vegetarian sauce. Heck, throw in some spinach. This recipe makes a ton of sauce and it freezes great. Heat some olive oil in a large saucepan or dutch oven over medium. Cook the onions and garlic just until they are soft. Don’t let them brown. In a separate skillet, brown the ground beef and sausage and drain very well. Add the tomatoes and paste to the saucepan and stir. Stir in all the herbs and pepper, then stir in the well-drained meats. Stir in about 2 cups of water, or enough to make the sauce not extremely thick. Taste, then add salt (I start with about 1/2 teaspoon). Bring the sauce to a boil, then reduce the heat to a low simmer and cover. Let it simmer for at least 1 hour – 2 hours is better. Check after an hour or so, and if the sauce seems too thick, add more water. Taste and see if it needs more salt. In the Bull Durham days, downtown Durham, N.C. was perfumed with the scent of tobacco curing. Today, if you take a deep breath, you’re likely to get a whiff of baked goods instead. 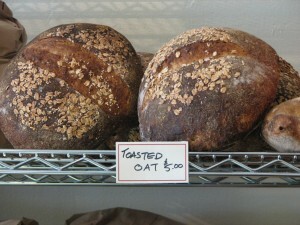 How it happened, I don’t know, but three bakeries have settled downtown (including the oldest, Ninth Street Bakery). nuts or raisins, and are made with croissant dough, with makes them different from the typical cinnamon roll. I also brought home a chocolate tart and what Mary described as a Canadian seven-layer bar. But if The Hub is reading this – so sorry, Bug the cat got them. Owner Ron Graff began at the Durham Farmers Market, and still sells there during the season. The store at 111 West Parrish Street opened in November 2011.